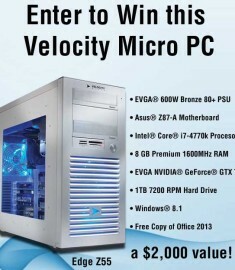 Enter to Win a PC with the Velocitymicro tech sweepstakes 2013. You could be the lucky winner and proud owner of an Edge Z55! 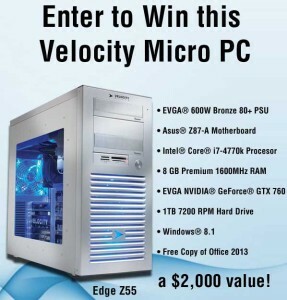 To celebrate the launch of Windows 8.1 Velocitymicro is getting excited and teaming up with industry giants (Windows, EVGA, ASUS, Intel, NVIDIA) for this amazing tech giveaway! Do not miss out on your chance to score free stuff and enter before the closing date of November 8th, 2013. Simply complete the entry form on the Velocitymicro.com website and share the contest with your friends. For every friend that enters you get a bonus entry (increasing your odds of winning big!). Tweet to the world about your contest and gain another free entry. 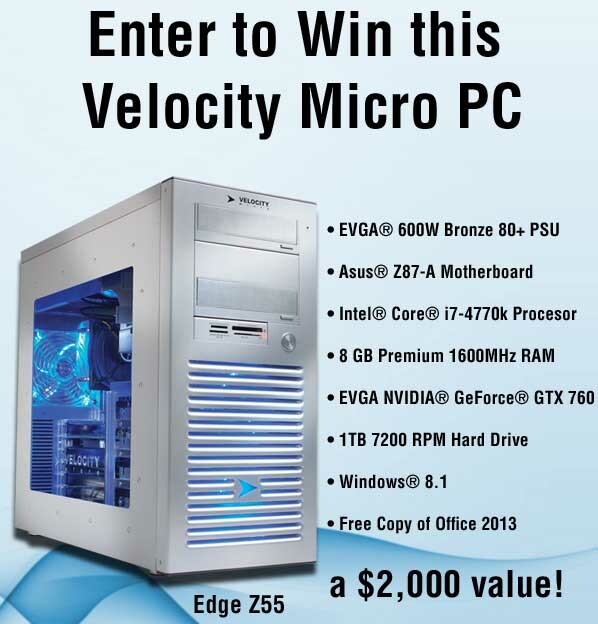 The grand prize winner will receive an Edge Z55 Velocity Micro PC with these awesome specs: EVGA 600W Bronze 80+ PSU, ASUS Z87-A Motherboard, Intel Core i7-4770k processor, 8GB Premum 1600MHz RAM, EVGA NVIDIA GeForce GTX 760, 1TB 7200 RPM Hard Drive, Windows 8.1, Free copy of Office 2013. If you are a gaming aficionado then this is a sweet gaming computer to meet all your needs. Perhaps you are self employed and work from your computer at home all day, this computer would make things run sooooo smoothly (at least technology wise). Maybe you just need a family PC which can put up with the demands of several family members using it one a daily basis. A PC like this has power and performance that regular computers can only dream of! You can run all the programs you need, surf the internet, photoshop your favorite pictures, Skype your friends and family (basically you can do almost anything you need a computer to do). So enter to win a PC today and this tech grab bag could be yours.